← Plumlee on Team USA? Maybe! 10 points. 5/14 shooting. Overwhelmed by a good, not great, center in Nikola Pekovic. Blown rotations. Missed bunnies and a lack of touch in and around the paint. Jumpers that had no chance of going in. Gettable rebounds that went elsewhere. Allowing other bigs to establish strong post position while failing to establish similar positions on the other end. That was a recap Brook Lopez’s performance agaisnt the Minnesota Timberwolves, a disappointing 98-91 home loss that dropped the Nets to 2-2 on the young season. But at the same time, much of Brook’s struggles were out of character with the player the NBA has grown accustomed to. Missed bunnies around the hoop? The jumpers 3 feet east of the hoop? The inability to score off a basic post up or get to the foul line? Atrocious defense? Brook suffers lapses as a defender but has progressed on that end since the move to Brooklyn. Yes, Lopez has his warts, some of which will not simply disappear. But, he’s clearly a better player than he was tonight. Which brings 2 questions: What is the issue with Lopez, and how should Lionel Hollins handle it? Maybe he’s out of shape: This is no knock on Lopez, specifically. When you sustain a severe foot injury, you cannot run. You cannot walk without the aid of a cane or cast. Can you lift weights? Sure. But an NBA game is a 2.5 hour grind, of intense running up and down a court. From December 20, 2013 through November 3, 2014, Brook did not do that, in a game that counted. Not once. What happens when you stop running and moving? Your body becomes unaccustomed to running, moving, jumping. Your endurance declines. You tire, and tire quickly. And what happens when you’re tired? You don’t fight for post position, because you’re tired. Or make that quick rotation. Or give the extra bit of footwork on that jump hook necessary to get into position to score. You start making mistakes, bcause your body does not make the correct play instinctually. Brook looks completely out of shape while he is on the floor: he looks fine, in regards to his weight and build. But as he plays, you see a player who is nowhere near ready to compete in an NBA game for 30-35 healthy productive minutes. Maybe he’s feeling pain, or thinking about his foot: Of course, if Brook has foot pain, it would explain much of his poor play in game 2 back. But perhaps there is no pain, and he is thinking about his foot as he plays. It would be hard for Lopez not to think about his foot. Three surgical foot procedures since the NBA lockout ended. A realignment of the bones in his foot. A sprain almost immediately upon getting back onto the floor. It is understandable that while playing, Brook would think about his foot, hoping not to injure it and managing how he moves it. The problem? Basketball requires moving swiftly. Using quick footwork to position yourself for that jump hook. Making that hard cut. pushing that offensive player on that box out. Sliding to make a quick rotation. Those things become hard to do when you are thinking “I cannot hurt my foot,” rather than thinking about the task at hand. And any sport is a game of inches. Being a half inch off balance on the jump hook is the difference between two points and a missed hook shot. Being a step slow on the defensive rotation is the difference between a basket for the Timberwolves and a good contest and stop for the Nets. Whatever the reason, one thing is true: Lopez, while he has his problems even when playing his best basketball, is nowhere near that level at this moment. He has played two competitive, meaningful games since a third foot surgery and major realignment of the bone structure of his foot, and it is clear that he is nowhere near himself on the court. He looks uncomfortable, nervous about taking contact (this is not usually an issue: Brook is often maligned for not being physical but when healthy typically makes every effort to be aggressive, often limited by a lack of quickness and athleticism to beat a defender if anything, not a desire to), and out of place. That hopefully will change as the season progresses: if he can remain healthy, he should get his wind back and grow secure within his body once again. So What does Lionel do from here? That is the tough balance. While Mason Plumlee is perhaps more popular than Lopez: he is cheaper, younger, was not nearly traded for Dwight Howard, is more athletic (athleticism always gives the appearance of playing hard), and does not require the ball to be effective. However, for all the love for Plumlee, he commonly blows rotations, struggles every bit as much as Lopez on the glass, and, unlike Lopez, is not an elite scorer. The Nets are able to put Brook on the move, and run set plays designed to get Lopez baby hooks in the paint: the same plays are simply less effective when run for Plumlee. Hollins knows that, and knows that, ultimately, when May comes, the Nets’ best lineups will feature Deron Williams, Joe Johnson, and Lopez. Right now, that may not be the case: if Lopez is this compromised as he recovers from an injured man who could not walk without an aid into a rejuvenated all star, he is likely not as good of an option, at this particular juncture, as Plumlee. That present Hollins with a tough issue to balance. Tonight, he played Lopez through his struggles. By doing that, you may help accelerate his injury recovery: the more healthy minutes, the less he is yanked from games, the better his confidence in himself and his foot, the more prepared he will be for the spring, when the Nets very much need not just a healthy, but a fully recovered Lopez. For all the talk of injuries being mental for Williams, they surely are for Lopez, whose personality lends itself to getting down on himself, and insecure in his abilities. However, it is also true that if the Nets give Lopez less minutes when he is struggling, that they will be better off for it in the short term. Would Plumlee, +17 tonight in his minutes, have been more useful than Lopez in dealing with Pekovic down the stretch? NBA games are won and lost by many, and while no player is every fully to credit for a win or blame for a loss, Lopez bears the lion’s share of fault for the Nets loss to the Wolves. Pekovic absolutely owned him. While Ricky Rubio outplayed Williams late, Williams torched him all night (Williams lacked confidence late, or perhaps has conditioning issues in his injury recovery as well; his assertiveness declined as the game went on, but he also carried the Nets as the team stood and watched early). Johnson started slowly but had a great close to the game, and the Nets got some decent role player contributions from Jarrett Jack (his best game of the year), Mirza Teletovic, and even Alan Anderson. The bottom line is that the Nets generally got enough from two of their top three players to win, and given Minnesota’s status as a likely lottery team, got just enough from their role players on their home floor. They played poorly overall but competed, and had they gotten decent center play against Pekovic, they would have won the game. What they got was awful center play, and Lopez was at the heart of it. Would Plumlee have fared better? It’s very possible; plus minus can be misleading but it told a true tale tonight. But the Nets went with working on getting Lopez back to full throttle, as opposed to reacting to his poor play by playing Plumlee, who was having a better knight than Brook. 82 games sound like a lot but they disappear fast: last year, even in a slow starting Atlantic, the Nets could not recover from their 10-21 hole in time to win the Atlantic, and that team had more dimensions than this year’s version given the facets of smallball that Livingston and Pierce presented. Essentially, Lopez’s poor play tonight felt like three parts injury recovery, one part “he is who he is.” As Lopez works on those three parts, expect some rough outings like tonight. But how long can Lionel ride him with the playoffs, home court, division, and overall team habits on the line? 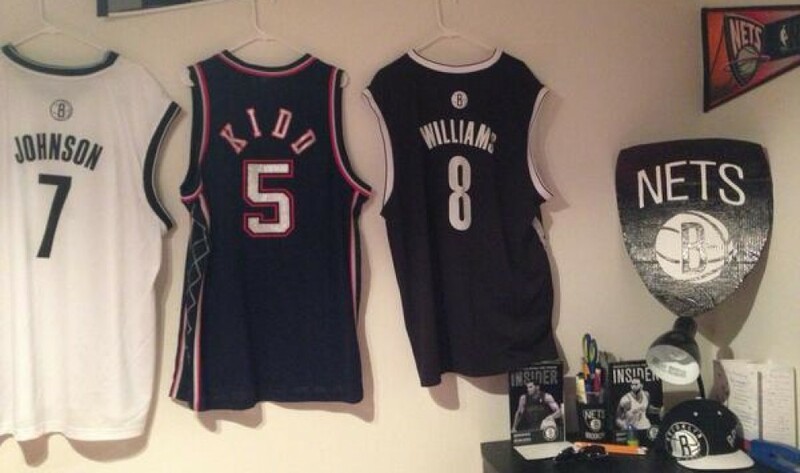 Deron Williams’ start to the season deserves its own post. The he’s back proclamations are premature, because he is not back, but he is very much on the right path. If Utah Deron is a 10, and last year’s Deron is a 1, Deron is around a 6.5-7.5 at the moment — the improvement is significant, but not total, and he still struggles at time with his confidence as he rediscovers what he can do and grows accustomed to knowing his body’s limits. He is also struggling with his shooting given his nagging wrist/hand issue he has recently developed, and needs to stroke the ball more cleanly to open up more of his game. Alas, Deron looks better everytime he takes the court, and so far, so good regarding his recovery. Still, he’s not “back.” Not yet. I love what I see from Lionel Hollins early in his tenure. There’s much to say, but one key: he has this team playing hard. The loss to Minnesota, while a bad loss that will sting, was an example. Minnesota last year would have stretched that 17-2 lead into a larger lead, or held it longer. The Nets did not allow that because they competed extremely hard. Lopez was awful. Kevin Garnett was bad. Multiple Nets were bad, or provided nothing of substance. Bojan Bogdanovic still can’t locate Kevin Martin. But the Nets competed, and that was why, despite playing a very very bad game from an execution perspective, they gave themselves a chance to win. They lost because they did not play well enough to get it done, but Lionel has the troops fighting. Bojan Bogdanovic is off to a strong start from a developmental perspective. You can see his basketball IQ in timely cuts to the basket, and he can shoot the ball. He is a smart, instinctual player with clear NBA talent. He makes mistakes. He blows defensive coverages. But the talent is very clearly there, the upside very clearly there. The hope for Brooklyn is Bogdanovic is more productive in the spring than he is now. On that note, the hope is that Deron and Brook also are better in the spring than they are now. Mirza Teletovic is playing very good basketball early in the season. Even his down game against the Wolves was as good as an average game for him a year ago. Good point. I have noticed this, and sometimes I wonder if it’s conditioning–you slump down and perhaps hold your legs because you’re tired. His conditioning has never been ideal, and I feel it is worse now that he’s still recovering. Re: Lopez’s defense…why does he bend at the waist when guarding opposing big men near the basket? It’s as though he ‘s guarding a point guard at half court? He’s 7’ tall. Stand straight up. Make your presence felt. Its frustrating to watch. He’s not a quick leaper and by bending at the waist, it detracts from his main advantage…ie. his height, size. If you haven’t noticed this, take a look tonight.